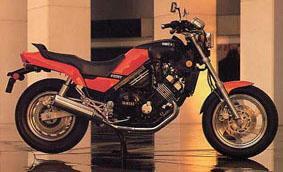 Mr. Araki remembers: "V-max had its first debut at the US dealer meeting at Las Vegas in October 1984. The bike was targeted for the 1985 season, to be sold in US first. Its key word was as simple as effective: American Hotrod. Its sensational appearance was very different from other typical American models at that time. So the bike became the highlight of the dealer show." Says Mr. Araki: "There was one impressive scene I saw, when I visited the USA to study the market. It was a 'Bridge Race'. Each time two bikes bikes lined up and set off. They simply competed for acceleration speed for 400 meter. Young people were crazily enjoying the Zero 4 race (400- meter race). (Of course it was not an official name of the race but Yamaha R&amp;amp;amp;D staff nicknamed it). They were using a bridge over the Mississippi River. They started from one end of the bridge, and the finish line was the opposite side. It was a simple rule. First concept I imagined from this impressive race was 'To make a bike, which is strong at straight lines and really fast.' It was the birth of the V-max concept." With holding this impression in his mind, Mr. Araki crammed himself in a room of GKDI design company in Santa Monica, California, a external Yamaha design office. For nearly one month with his colleagues, Mr. Ashihara (engine design) and Mr. Kurachi (body design) they worked to put this image on paper. Ed Burke, senior product planner from Yamaha US, supported the team in concept work and research. After intensive studies, they created a 1:1 rendering sketch. As soon as they completed the sketch, they flew back to Japan with it to present it internally. 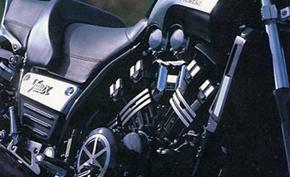 Mr. Ashihara was responsible for V-max engine design. Mr. Ashihara: "We have been designing an engine for the Venture Royal at that time, but it was prioritized to have its power in low and mid range. It honestly had potential, but we had to sacrifice its horsepower for better practicality. We had to clear the emission standards and all in all we faced a lower power output than we desiered. That made us a bit frustrated and we were excited to brow off our frustration with V-max. However, honestly speaking, it was unexplainably tough to improve the only 90 HP engine of the Venture to 145 HP of V-max." Cutaway drawing 1986: the V-boost intake in blue and exhaust in red. Fuel tank under the seat and aircleaner under 'tank-cover'. Mr. Ashihara continues: "Not only we had to increase peak power in the range from 7000 rpm to 8500 rpm, but also we had to review overall features from different aspects such as compression ratio, intake and outlet air induction rate. We also considered using a turbo to increase the horsepower. But there was not enough space for it. Then, we figured out the V-boost. This new technology 'V-boost' gave unexpected high horsepower. When the performance increased, of course, we had to improve the drive system and its durability. There were many things to solve as we progressed further." Mr. Araki adds: "We had a lot of trouble with drive units to make it sustainable with the high power. Our try and error efforts continued until just before we started mass production." As soon as the mass production started, V-max made its debut in the front of US journalists, followed by Japanese and European media. Needless to say: most of journalists wrote complimentary remarks and how they were impressed by V-max excellent acceleration, style and riding feeling. V-max received high evaluation from Media all over the world and strongly sold in 1985 and 1986 immediately. Mr. Araki starts to talk disappointedly: "It was the same V4 engine as the V-max one, only with less cc, however the idea was to give the engine more powerful looking by putting the tank lower, to realize the designer's intention. The idea to design a new V-max 750 seemed not so difficult at the beginning, but once we simulated it, we found out that we couldn't keep the tank lower. And the benefits were marginal over V-max 1200." Mr. Araki: "We gave up the project of a 750cc engine variation on V-max. 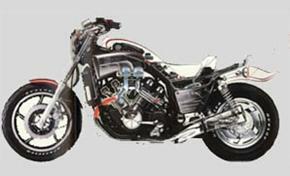 However another idea came up, to make a new American model with the engine of FZ 750. Soon this became the FZX 750. There was a limitation to succeed a real macho image comparable to V-max due to the 45 degrees forward inclined parallel 4-cylinder. Therefore we had to take a chance with the unique and original design of FZX." 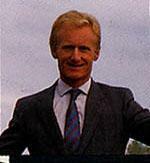 Jean Claude Olivier pushed for introduction in Europe, since he was personally convinced of the bikes potential. With his intuition and feeling for motorcycles Jean Claude Olivier, director of Yamaha Motor France, pushed very hard to get V-max homologated in Europe. It was again tough for Yamaha engineering to adopt the bike's chassis setup for European high speed road use. In 1986, France was amongst the first countries to introduce the bike. 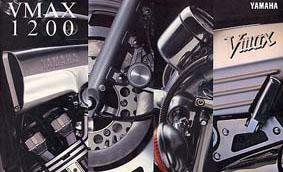 And in the later nineties, French bikers even bought more V-max than their counterparts in America. Still today, V-max is a cult bike all over the world. It created a category of its own.